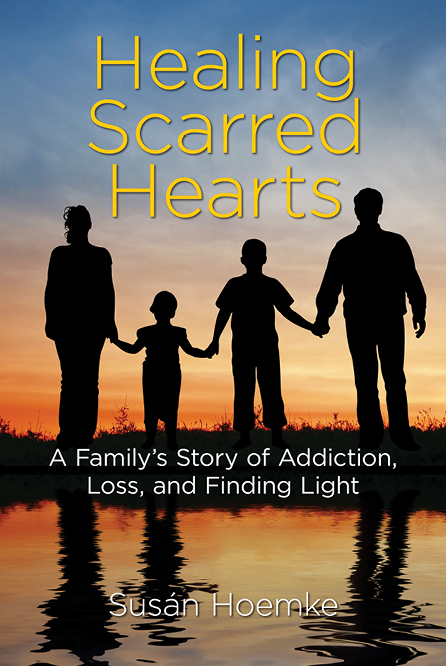 In Healing Scarred Hearts: A Family’s Story of Addiction, Loss, and Finding Light, author Susa’n Hoemke tells the story of her son Hayden’s life from its happy beginning to its tragic, sudden end. In her book, Hoemke reveals her sorrow and heartache as she watched her son travel down a destructive path and transform from a happy boy into a frustrated, addicted teen during his high school years. Each chapter follows a different part of Hayden’s life. With her book, Hoemke hopes to spread drug awareness to all parents throughout the country. Hoemke’s emotional account of her son’s life brings to reality the horrors of drug addiction and the toll it takes on family life and relationships. By telling her story, Hoemke hopes to inspire other families to openly discuss matters such as drugs and alcohol with their children and warn them of the many dangers that accompany usage. Despite her grief, Hoemke spreads a message of hope to those who are affected by or have lost someone to the disease of addiction. Hoemke hopes that by bringing awareness to this issue, more parents will discuss this matter with their loved ones, and fewer lives will be lost. I had a chance to interview her to learn more. I began to think about our family, friends, and people of every walk of life who could face painful situations like ours, which led me to believe I must share what I know. As addiction began to be discussed on the news in 2016, because of heroin, opioid crises and overdoses on the rise, I remembered my son Hayden’s words when he was clean. He said, “Mom, being an addict is terrible, and I do not want anyone to be like me. Maybe someday I can help people.” I know Hayden would want this story told, so, with my family’s support, I share it for him, with hope that it will help others and bring more awareness and understanding to addiction. I also want to help others find peace and know they are not alone in the battle of addiction and not alone recovering from loss. How did writing this book help you through the difficult emotions that surround loss? I have been able to heal through writing because it has been therapeutic for me. It was hard, however, because in order to get our story from my mind to paper, I had to relive those hard eight years in my head. It took many tears and a lot of tissue, but I began to notice the great release of pain and the ability to let go of the shame when writing. As time passed, I began to feel a sense of urgency to educate others and share everything we had experienced to hopefully take away the shame and pain others might be living with—or might not even know is possibly coming. How can people support families that are struggling with addiction? If we all can lift the negative stigma of being an addict or having an addict in the family, addiction can be openly discussed without shame and understood as a disease. Do not be reluctant to ask questions so you can hear and understand what they are going through. Silence will leave families and addicts living in the dark who are in need of much light. Where can parents go if they have a child struggling with addiction? Talk directly with the person you are worried about and try to get them to open up to you. Many times, people are reluctant to say anything and are possibly in denial—but do not wait. The earlier you understand there is a problem, the better the odds are for your loved one. If the person is a minor in your home, and you believe they are abusing legal or illegal drugs, buy an advanced drug test from a local pharmacy, insist they take the test, and use an open-door policy when collecting the urine sample. You are definitely not alone in your struggles. Let go of the shame and embarrassment you might be feeling. Find an outside family member, friend, counselor, family doctor, neighbor, or call a church near you that can give you direction and support. In the first stages of trying to understand what is going on with your loved one, have patience, but be persistent and ask for help.